Marty and Karen both grew up in Juneau, Alaska. Marty graduated from Biola University 1989 with a Bachelors of Arts in Communications emphasizing Radio and TV production. He has served Wycliffe Bible Translators since 1991 as an audio recordist and A/V consultant. Specializing in training nationals who are working in media in the minority languages with whom Wycliffe is working. Karen graduated from Moody Bible Institute 1991 with a BA in Sacred Music. 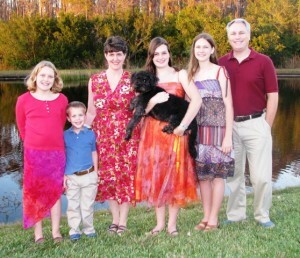 In addition to helping her husband, Karen teaches Jr. High and Sr. High Choir at Lima International Christian School. When she can, she also loves to teach music theory and music appreciation to missionary children. They have four children: Heather, Kara, Summer and Nathan. Their main focus is training Latin Americans who work in minority languages how to produce non-print media. In other words, we train people how to create radio programs, audio dramas, videos, and a multitude of other materials in their mother tongue. These materials are always based in the Scriptures and always promote the use of the Bible in the native language to those who will never learn to read. Train = Disciple, mentor and equip with an emphasis on sustainability. Audiovisual = Audio and video programs such as in dramas, teachings, and scripture video dubbings. Scripture-Based = Programs are based on a Biblical truth. Scripture is read aloud in every program. Culturally Relevant = Programs that target profound issues connected to the daily lives of the intended audience. Minority Languages = Programs are produced in the heart language of the minority group.